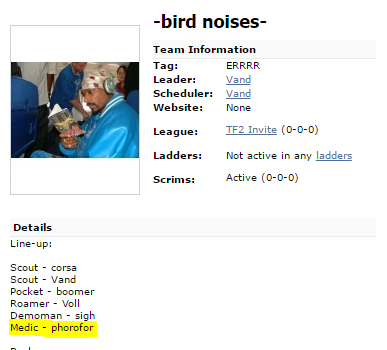 phorofor playing med for bird noises? Just of out curiosity: How many viewers did we get? I tuned in this morning after waking up and just caught the last ~10 minutes where there were still a little more than 2000 people watching. what was the peak? I don't want to ditch this like other things, but I feel it will just be more bad rep.
Don't put yourself down too much, it is great that you are showing ambition and are trying to create things for the TF2 community, which I would guess most people can appreciate. The problem with your projects (this and the pickup site one you posted earlier) is that they seem superfluous, they don't really add to the services that are already provided and are thus looked upon with scepticism. In addition to this, they seem rushed/unfinished, and as others have pointed out, the way you present them is not very professional. Every project that is presented here faces critique and criticism, especially if the concept is vague or promises too much. In my opinion, try not to force it. Don't create a service just for the sake of it, but rather look at what is wanted/needed and then if you have a solid idea, put enough time into developing the concept. The TSU vs Froyo screenshot says "Team Solo Mid", also I'm pretty sure that sfm in the background is one that uberchain made for i55, do you have permission to use that? Khan infamousquaredhttp://www.amazon.com/gp/product/B00V9RKSAA/ref=s9_simh_gw_g107_i1_r?pf_rd_m=ATVPDKIKX0DER&pf_rd_s=desktop-1&pf_rd_r=0D4GCRA8HY7NT5Y28VJT&pf_rd_t=36701&pf_rd_p=2079475242&pf_rd_i=desktop just to make sure, are these the same ones? its from the uk amazon, seems like it should be the same model, but maybe there exist different versions? Ordered on January 25th from fewolfmall, they just arrived. Everything is in chinese, as is the website that the confirmation QR-code takes you to, but google translate seems to confirm that it says they're genuine. The packaging seal had been opened, but the actual case that they come in was sealed, so take that as you will I guess. Pretty happy with the sound quality overall so far, the sound is very rich, but I feel like there is a bit of static (might just as well be the recording itself). Why did you exclude Starcraft? Genuine question, there seem to be some mixed opinions throughout the thread. What makes Starcraft 2 easier than other RTS, in your opinion? LarryOsmen41 namassinSurfing and air control are important Yeah this is one of my main things I want to work on as medic, the other stuff like uber counting and positioning are just kinda learned over time. Is there a good place to learn this specifically for medic or should I continue doing jump maps for soldier and apply what translates? I love how quick these highlights are up, it hasn't even been 24 hours. That's some great coverage right there!